Welcome to the Our Daily Bread Designs Birthday Blog Hop celebrating Rick's Birthday! If you've ever attended one of the many Rubber Stamp Shows that ODBD sets up at, then odds are you've probably met Rick, you'll usually find him working the cash register and talking to the customers! I've had the pleasure of working with Rick on a number of occasions and am thrilled to participate in the blog hop! Happy Birthday Rick, hope you have wonderful day! If you arrived here from Angie's Blog you are in the right place, if not, you might want to head back and start at the ODBD Blog so you don't miss any of the fabulous projects! You'll want to be sure to visit and comment on all the participating designers blogs, because one of them is a hop hot spot and a name will be drawn from that blogs comments to win a $20 ODBD gift certificate good toward ODBD Stamps. You have until Friday, January 11th at 8PM EST to leave comments. Inspired by the sketch at Addicted to Stamps Challenges, I used stamps from Our Daily Bread Designs Happy Retirement set along with pattern paper from the KaiserCraft Tropicana Collection. The image is stamped in Black Archival on a piece of pattern paper from KaiserCraft's Tropicana Collection, then colored with STAEDTLER Karat Aquarell Watercolor pencils. The edges of all papers are sponged with Chocolate Ink. To embellish I added a piece of Fish Netting. Thanks so much for stopping by, your next stop on the Birthday Hop is Dawn's Blog. Ahhh, I'd love to be there! Well done, Lisa! love it!! the netting is cool! What a beautiful masculine card, Lisa!! I would love to be relaxing there right now. The added net is the perfect touch. Rick will love it! What a beautiful and relaxing scene!! Love this! Gorgeous! The DP is fantastic too. Lovely scene for a man's birthday card. Great job. Fabulous card, looks like a great place to be on your birthday. Ahhhhh! Now this does look relaxing!!! I love the fish netting you added. Perfect touch and he will love this! I have seldom seen a card this nice. The coloring is over the top and the choice of design papers and sketch perfect. All I can say is take me there... great card. Hey, this reminds of home. I love the tropical theme and feel. Love the layers and the relaxing scene. I get there are MANY days when Rick wishes he could plop his weary bones into that hammock! Love your card!!!! Colors, layout papers..........and the fact that Rick is OLD! Rick will surely appreciate this visual trip to the tropics! That fishing net is the PERFECT addition to your beautiful creation. I think we all need a card like this to dream on. I'm sure that Rick would enjoy dreaming of a vacation if he received this card. It's so relaxing. great colors. Did you ever capture the tropical scene ! Love the piece of net, colors, layout. Really great card. Great card. Love all the layers and details. This is a great card, love the idea of being somewhere warm in the winter. very cool, like the stamping on the designer paper and the background papers are a great compliment to the image! The combination of background papers with the center scene is just perfect and makes you feel like you are there! Very nice. My hubby would love those palm trees! Love the layout and coloring. Fabulous, Lisa! Love your tropical card w/ its super colors and palm leaf papers. Remind me of the town where I grew up. Great card for Rick and he will love it. On a cold moring like we are having here, this card just makes me yearn for tropical climes. A great masculine card. Love it. A touch of the tropical in the middle of winter. Makes me wish for warmer weather! Great card! I love the netting!! Thanks for sharing. All I need is a Pina Colada to feel like I'm right in the tropics!! Great card. Can see this being a wish for Rick's BD - a nice vacation on an island with Kelley!!! Great layout and the perfect idea - RELAX!! Makes me want to b somewhere where its warm not snowing! :p love it! Oh my, that is a welcome sight on a day when I've just had to de-ice the car! The netting is such a fabulous touch, I can just imagine the lovely oil smell it would have IRL. Great papers, too! Great scene for a male card!! Great colors. Coooooooolllll, relaxxxxxxxxxxing dream card - esp. this time of year. now here's the card to go visit after an awesome birthday. have a great one! COOLNESS!!!! Love your card from corner to corner!!! I always look forward to seeing what you've come up with!! HUGS!! Love the addition of the fish netting!! Such an awesome card! Ahhh...a great relaxing card...wish I were there!! It's fun to see this tropical card on a gray/slushy day in Seattle! I love the fish net addition. Now this is what I call relaxing!! Wow...let me at that hammock, where the warm breezes blow...enjoying the sun, smelling the sea air...hmmm yup...Rick will love this I'm sure...what an awesome card!! Bet Rick wishes he could jump into your card and relax! Rminds me of being in Jamaica on the beach. Nice card! "Happy Birthday Rick!" Very tropical! nice for birthday. also good for a retirement or vacation. Pretty use of colors. Thanks for sharing. Reminds me of wanting to be on vacation. "cool-looking" card; thank you for sharing. The fishnet embellishment is so clever! Love the scene----wish I were in a warm place now. Thanks for sharing! what a relaxing card! Love the colors and the serene scene. What a nice card. Would love to be swinging in that hammock! Hope Rick's birthday is just great. Perfect retirement images and card you colored!! Great card, can I go there? Absolutely love this card! The paper is a perfect match! Oh, to say good bye to winter and hello to this awesome scene! Beautiful! Happy Birthday Rick! Great card...it really does make you feel like relaxing. Neat idea to include netting! Don't you just love working with watercolor pencils? They're the best! Happy Birthday Rick! 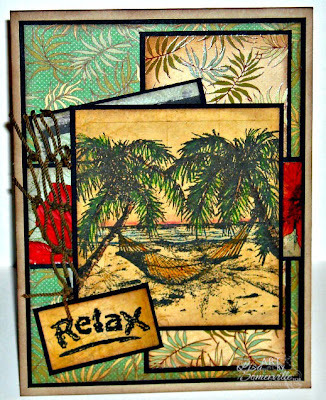 This card is to relaxing...particularly with the inclusion of the netting! Where is my hammock now?!?!? I'm sure Rick wishes he could be there for his birthday...just relaxing in the sun! 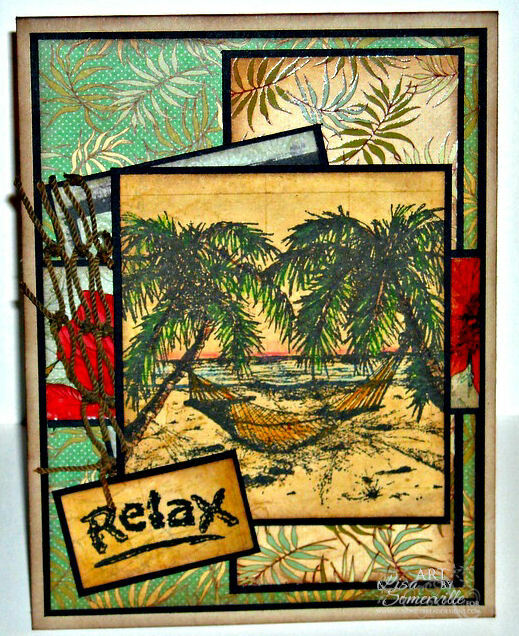 What a fabulous tropical scene and a wonderful masculine card, Lisa! Wonderful card. It feels just right this time of year to dream about kicking back on a beach in a tropical paradise- a great gift for Rick! It's like a tropical island card! Love the papers. So cool!!! Thanks for being a part of Rick's hop!! Your card is realy beautiful!!!!! Thank you for joining us at ATSC! !